The study of shock wave is of significance in understanding supersonic flow. 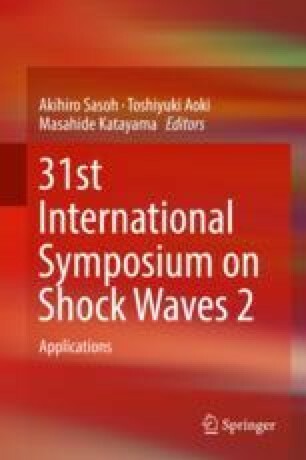 In this paper, we describe about the three-dimensional (3D) quantitative density measurement technique of unsteady and discharging shock waves. In the experimental research areas, the supersonic unsteady flow fields have been commonly observed by qualitative and two-dimensional (2D) visualization methods, such as shadowgraph, color schlieren, or 2D interferometric images. On the other hand, holography and computed tomography (CT) methods have been applied to the measurement of three-dimensional flow fields. The unsteady flow field around a cylinder by discharging shock wave from a cylindrical nozzle was successfully reconstructed by algebraic reconstruction technique (ART). In this study LICT technique is applied to observe more complex flow field than our previous study induced by discharging unsteady shock wave around a cylinder from a cylindrical nozzle. Three-dimensional flow fields are reconstructed by ART. The obtained results and features of high-speed and unsteady flow field will be discussed.